The Samsung Galaxy S9 and S9+ were among the most anticipated devices at MWC this year. At first glance very similar to the previous generation, they introduce some new features but leave out others, such as the fingerprint reader under the display. 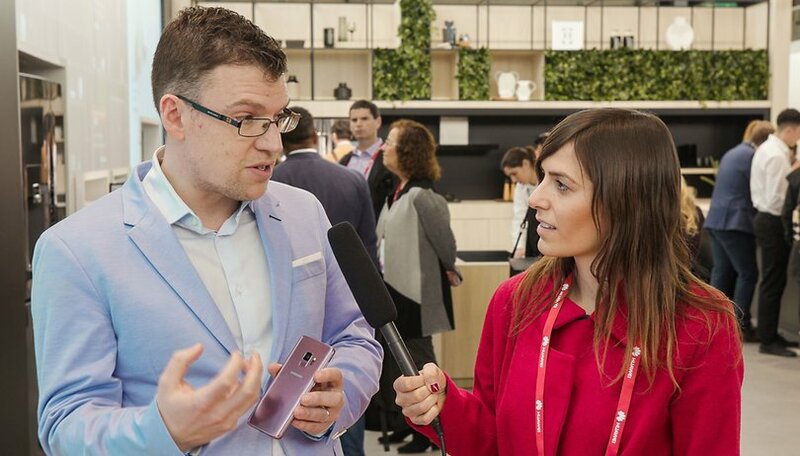 We had the opportunity to ask some questions about the new flagships to Mark Notton, Samsung's Director of Product Portfolio & Commercial Strategy. At first glance, S9 and S8 are very similar to each other; the same goes for the Plus variants. The new colors are one of the distinctive elements: Lilac Purple, Midnight Black and Coral Blue. Should we expect more color variants to come in the coming months? Mark reaffirmed that the brand has already made a commitment to offering new colors and does not intend to neglect this aspect (the S8 in red is an example) but at the moment there is no word about new shades for the S9. Some new elements introduced in the S9 and its Plus variant can be noticed on the body of the two devices. Samsung listened to users' criticism and repositioned the fingerprint reader to make it more easily accessible, as well as optimizing it in terms of speed and precision (obviously only an in-depth test of the device can confirm this). The integrated fingerprint reader underneath the display was awaited on the Galaxy S9 but didn't arrive. Why? Mark explained to us that the brand, before implementing a new technology like this, prefers to test it thoroughly and be sure it is sufficiently mature. We have seen how some Chinese manufacturers are working on it but when it comes to Samsung, and in particular popular devices such as the S9, the number of units produced is high, so it needs to be perfect. The adjustable aperture tries to improve one of the weaknesses of all cameras mounted on smartphones; AR Emoji focuses on entertainment and social media (we've already seen it on iPhone X under the name of Animoji) and SuperSlowMotion for people who love to play around with the camera. The iris scanner and face recognition combined to ensure greater security and user experience. No new components in this case, it's more about putting the material together, optimizing it with the software and improving the existing tech. What is the future of Samsung smartphones? Bixby will get smarter, and the Infinity Display will continue to dominate the front. No other details were revealed to us and when I asked if we could soon see a folding screen like the one we chatted about in the alleged Galaxy X, Mark Notton replied that there will be news coming from Samsung, but only when these technologies are properly developed. Nothing is coming this week, but who knows, perhaps we will see the release of a smartphone with a folding screen after all. Do you think the Galaxy S9 is really innovative? Which features impressed you the most? It must be available at Note 9. We hope too but it's not sure yet!